Coconut Grove has some swanky newcomers. 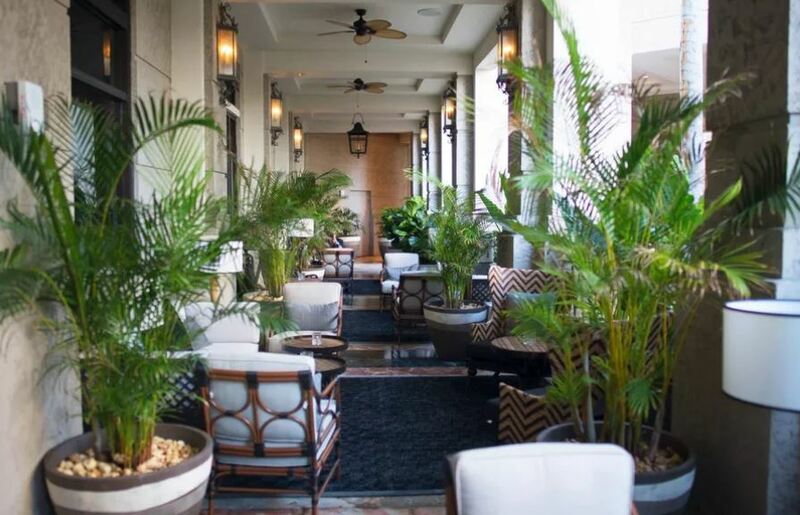 Tucked inside The Ritz-Carlton Coconut Grove (3300 SW 27th Avenue) are the now open Isabelle’s Grill Room & Garden and adjacent The Commodore bar, both operated by LDV Hospitality, the team behind Miami Beach’s Dolce restaurant and Regent Cocktail Club. Isabelle’s Grill Room & Garden is named in honor of Isabella Peacock, one of the Grove’s earliest settlers. It boasts a menu filled with continental American cuisine with plenty of seafood influences. Think crab cakes, lobster pappardelle, grilled prawns, mac & cheese, and an extensive raw bar. The restaurant itself is decorated in dark woods, brass, cognac leather, with white and green accents. Adjacent to the restaurant is the trellised outdoor garden terrace with over-sized planters and landscaping, wood tables, white and taupe woven chairs, and hanging lights. Right next to it is The Commodore, which also has a history element behind it, as it is named after Ralph Middleton Munroe; an original resident of the Grove and commodore of the Biscayne Bay Yacht Club. The ebony, wood paneled space, accessorized with black and white coastal photography features a working fireplace, over-sized leather chairs and couches, and brass light fixtures. Outside features a tropical patio with rattan paddle fans and an eclectic collection of cocktail tables and chairs. Its menu keeps with the classic feel of its surroundings offering drinks like Manhattans, old fashioneds, papa dobles, and negronis. Standard bar bites like chicken wings and beef sliders can also be ordered. Isabelle’s Grill Room and Garden is open from 7 a.m. to 3 p.m. daily and 5 to 10 p.m. Sunday to Thursday and until 11 p.m. on Friday and Saturday. The Commodore is open Sunday to Tuesday from 5 to 11 p.m., until midnight on Wednesday and Thursday, and until 1 a.m. on Friday and Saturday. Offering happy hour from 5 to 7 p.m. daily.